Stewarts of America designs embossing tooling and machinery, all based on our pinned tool technology, including internal, post gusset tube embossing for industrial customers around the world. Stewarts of America designs embossing tooling and machinery, all based on our pinned tool technology. Films and heavy duty bags are often embossed to provide a non-slip surface between the bags to help prevent the bags from sliding against each other. Embossing can be used to create a texture on what is normally, a flat, slick film. The embossing works well in vacuum bags, allowing the air to be pulled out from the very back of the bag without restriction. Embossing is also used for texturing materials for sound absorbency and water diversion. Embossing can provide a textured surface for a consumer to get a grip on a package. 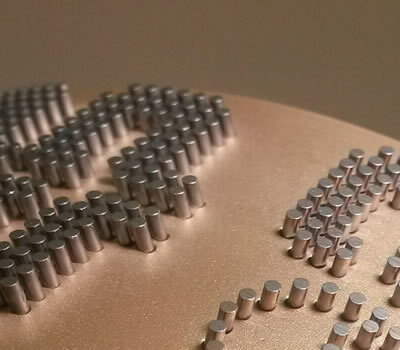 Embossing rollers are made with our pinned precision. The rolls are pushed against the material to be embossed and the pins push the material against an appropriate anvil backup roller. Embossing can be accomplished on a lay-flat material OR can be accomplished in the form of a tube, from the interior to the exterior of the tube using Stewarts of America's "inside out" technology. This allows the customer to be able to protrude the embossing to the outside of the bag, even if it is already in tube form! These embossing units are often used on post gusseting machinery. 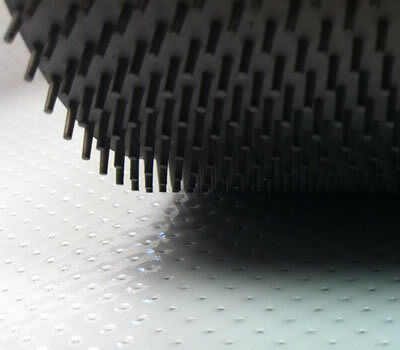 Stewarts embossing technologies can even be combined with our perforating technologies, making for very flexible equipment. Stewarts can design and build and embossing unit for your existing machinery. Even though our machine designs are all based on field-proven designs, we can custom make a unit for an unorthodox space. We will be glad to work with you on a custom unit that accomplishes your embossing or perforating goals. Embossing can be used in combination with perforating for a very flexible value add to your existing material. Unlike many competitors, we machine and fabricate complete tooling and machinery we make in our facility. This gives us complete control over the delivery, consistency of product and quality of product. It also enables us to give complete product support, down to the nut and bolt. Stewarts of America also manufacture unwind and rewind and slitting equipment if required. All our machines are designed by our engineers with input from our customers, so that we come up with a solution that is perfect for you. There is no project to big, too small or too unique!